A major peer-reviewed paper in Science Bulletin, a respected academic periodical, has accused the IPCC’s climate model of being riddled with errors. The authors of the paper –‘Why models run hot: results from an irreducibly simple climate model’ – have presented a new “simple model” that suggests the doubling of CO2 emissions could warm the planet by 1°C- significantly less than the IPCC’s predicted 3.3°C rise. 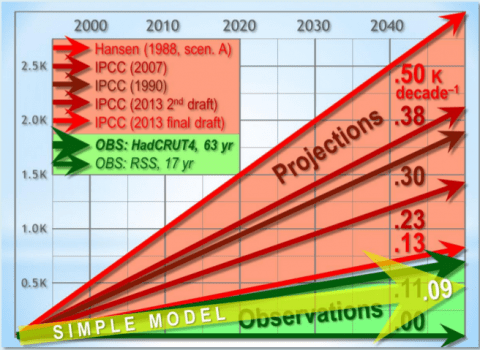 As seen in the chart above, the simple model proposed in the paper is closer to observed real world temperature change than the IPCC’s current and previous models. One particularity egregious error the paper’s authors level at the IPCC, is that it has been running made up figures in its climate model in order to pump up projected climate change projections – they overestimate population growth by over two billion.